Julius Erving, the great and wondrous "Dr. J," was the dominant player of his era, an innovator who changed the way the game was played. He was a wizard with the ball, performing feats never before seen: mid-air spins and whirls punctuated by powerful slam dunks. 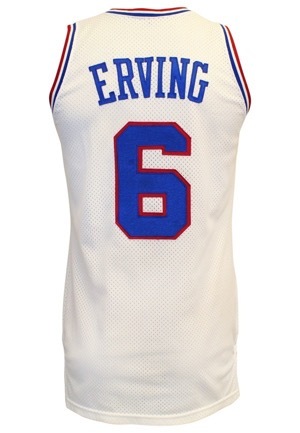 Erving was one of the first players to make extemporaneous individual expression an integral part of the game, setting the style of play that would prevail in the decades to follow. Dr. J was a true ambassador for the game. 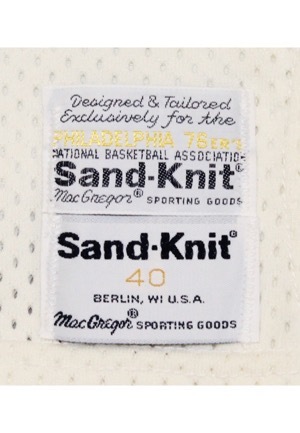 On the front left tail is the Sand-Knit manufacturer’s tag size “40”. Adjacent above is the “Designed & Tailored Exclusively for the PHILADELPHIA 76ERS” tag. On the right inseam is a “100% NYLON” flag tag with washing instructions. 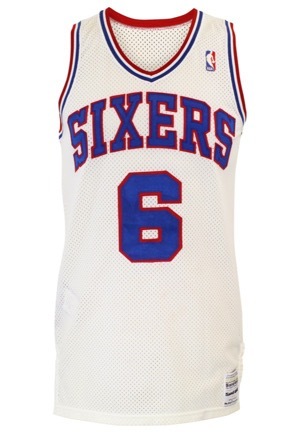 Across the chest reads “SIXERS”. Adjacent below and on the back is the player number “6”. These are done in blue on red tackle twill. Across the back is the player name “ERVING” done in blue tackle twill sewn directly into the jersey. This jersey is properly tagged, was presented to us as game-used and in our opinion shows appropriate use with yellowing to the body presumably from sweating.